Set oven to broil and prepare the asparagus and onion. 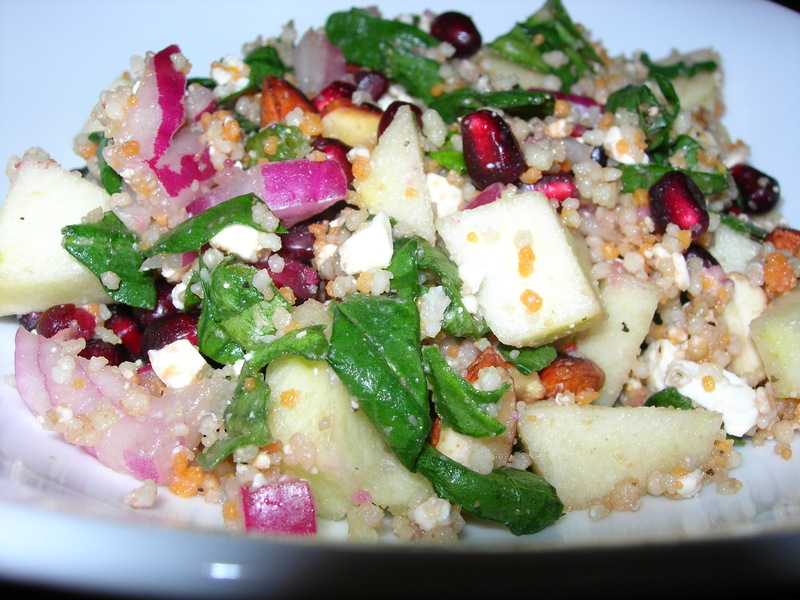 This flavorful and zesty salad takes about 15 minutes from start to finish. The first thing for a single serving is to cut 5 or 6 asparagus stalks in half lengthwise and then in thirds. This is with young, fresh asparagus. Late season asparagus, you will want to cut in quarters lengthwise so you have nice thin stalks. After I cut the asparagus, I cut three slices of onion crosswise, so I could separate the individual rings and drop them in a baking pan with the asparagus. I used my paella pan because I use it for everything practically. I did not add any oil or salt as I do when I roast vegetables. I wanted to broil just until they began to brown, not until they were cooked through. When they are browned, put on a salad plate. 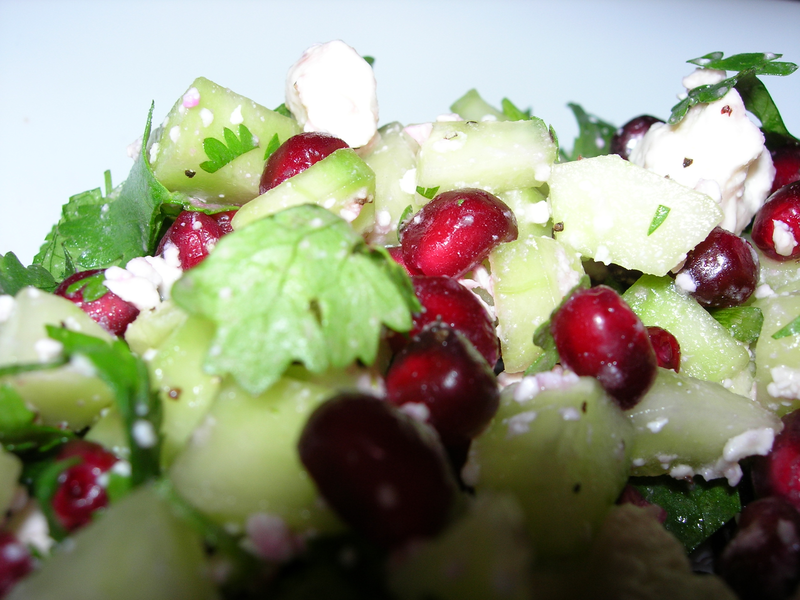 Cut a few grapes in half and toss on top of the veggies with a couple tablespoons of feta cheese. While the veggies were broiling, I mixed up a couple tablespoons of seasoned rice vinegar with a bit of mustard (1/2 tsp) and some salt and pepper. I added that on top of everything right before serving. The blend of flavors are delicious. 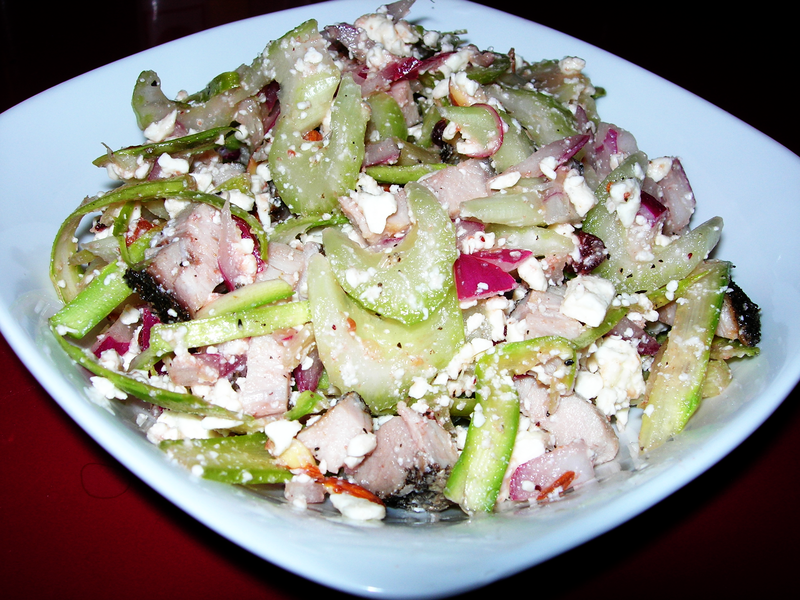 The asparagus is fresh and light with a bit of sweetness from the onions and grape. 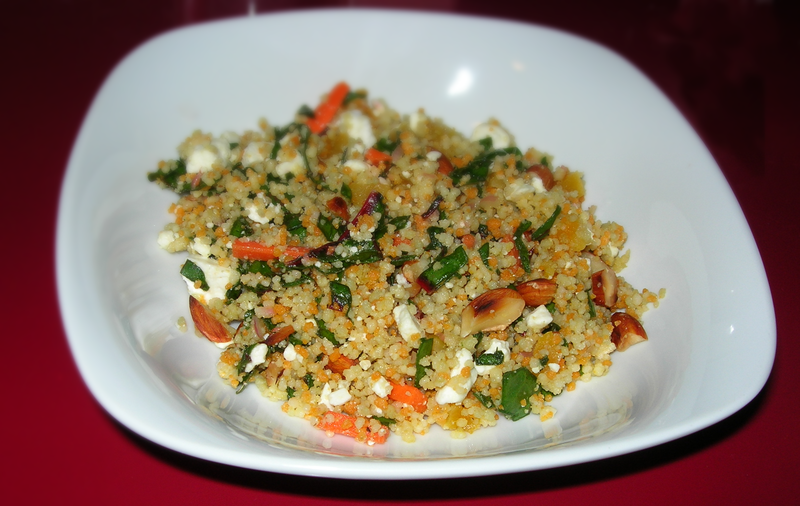 The feta adds a nice bit of fat and creaminess and the mustard vinaigrette blended the flavors perfectly. There are no real measurements for this simple salad. 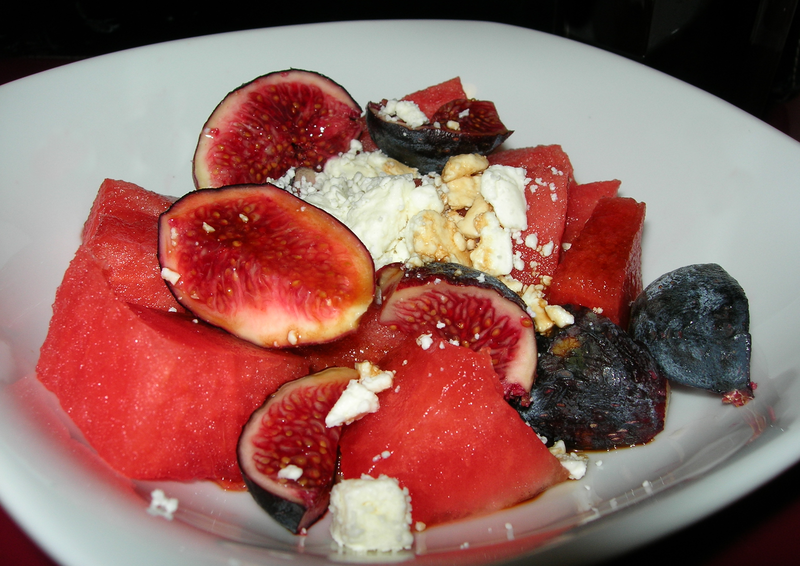 Cut some watermelon into one inch chunks and wash and quarter some fresh figs. Toss them in a bowl, sprinkle a bit of salt. 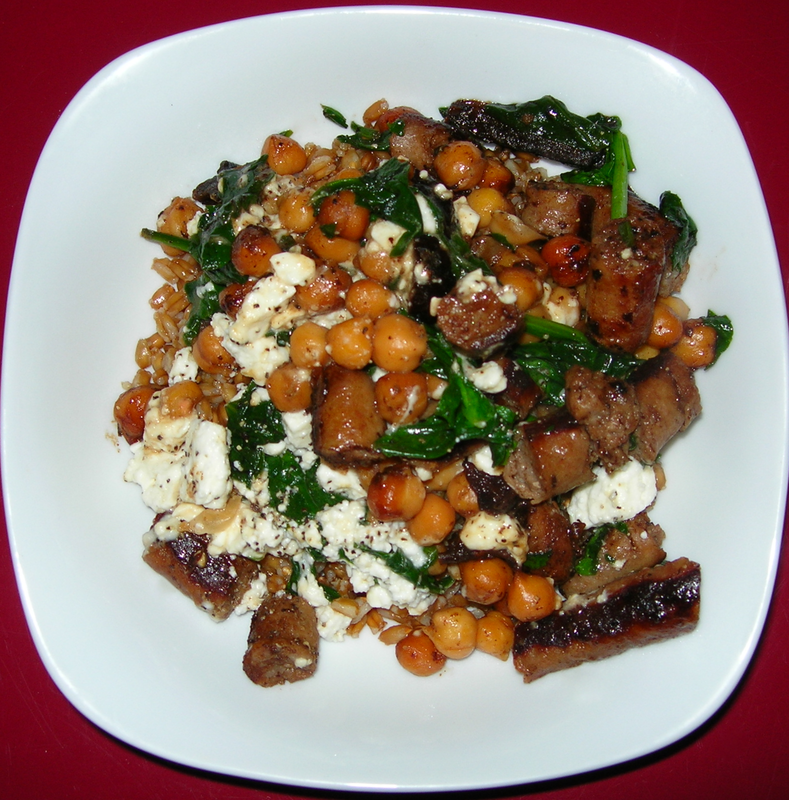 Add a tablespoon or two of feta depending on your preferences and drizzle a tiny bit of balsamic vinegar on it. You end up with a pretty and delicious salad. The feta adds just the right amount of tartness and creaminess. The balsamic vinegar cuts the sweetness. You can’t really taste the salt, but you can taste how it brings out the flavor of the fruit. I experiment a lot with cooking. Not everything works and when it doesn’t, it does not make it to this blog. The other day I mixed some cut up grapes with pomegranate and chèvre. It did not work. It was too sweet and needed more contrast. 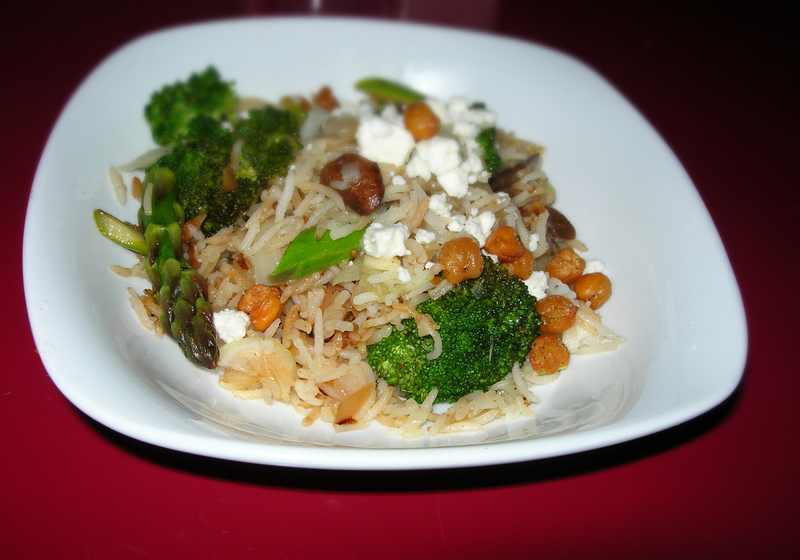 I thought I was on the right track though and decided to try feta because it is more sour, but still nice and creamy. 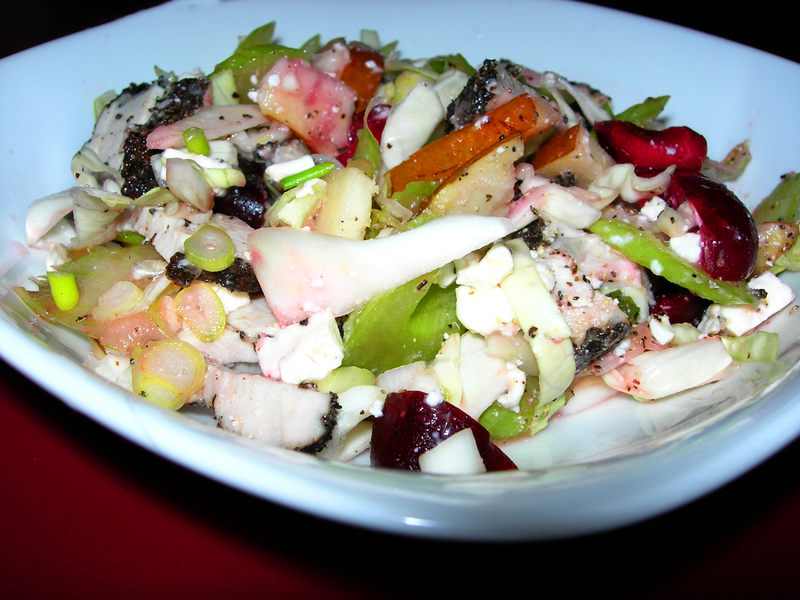 Just went I started to make the salad, though, I veered off in a new direction and ended up with a great salad that explodes with flavors. I started with about 1/2 cup of pomegranate. It is 1/2 the seeds from one pomegranate. I pulled out some green grapes from the fridge and noticed I had 1/3 of a cucumber in a plastic storage container, left over from a cucumber on rye sandwich and the side salad with my fish the other day. I thought I had better use that cucumber soon so, I put the grapes back in the fridge for another time and peeled and cut the cucumber into small pieces. I cut it lengthwise into quarters and then cut the juicy seeds out and just snacked on them. I did not want them in the salad because they would make it watery. Then I cut the long strips in half again and lined them up and sliced horizontally, giving me pieces similar in size to the pomegranate seeds. I took a small handful of cilantro and chopped it and tossed it in. Use anywhere from 2 TBSP to 1/4 cup depending on how much you love cilantro. I sprinkled a couple TBSP of feta on top and then added a dash of salt and pepper. I tossed with 2 tsp of red wine vinegar and let rest for about 5 minutes. 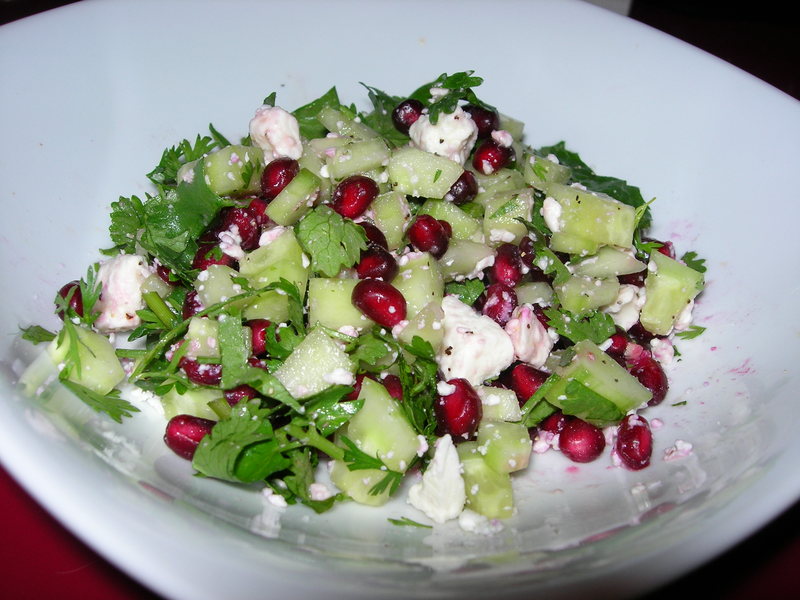 Here’s why this worked, the cucumber has a mellow, spring flavor that offsets the intense sweet-sour tang of the pomegranate. The cilantro adds a bit of earthiness and the feta adds a creamy flavor with some fat, which really helps the flavors blend and the acid in the vinegar brings out all the flavors to their fullest.